On Sunday, June 4th 2017, the St. George Serbian Orthodox parish celebrated the Great Feast of Pentecost. The congregation reveled in the hymns of the Feast as the Boza Yoksimovich Serbian Singing Society of Canton joyously sang the responses after weeks of practice. In particular, their English version of the Festal Tropar “Blessed art Thou O Christ our God…”, sung in the Serbian tonal setting, was magnificent! Those present also enjoyed the festive green of the Feast. The church was adorned with decorative fresh plants through the efforts of Ben Moretta and his son Ryan. They arrived very early to beautify the church, and to spread freshly cut grass so that the community might weave traditional crosses wreaths during the Vespers of Pentecost. 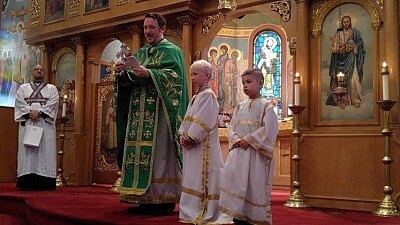 During the Divine Liturgy, Fr. Aleksa elaborated on a portion of the day’s Gospel message, John 8:12 – “When Jesus spoke again to the people, he said, ‘I am the light of the world. Whoever follows me will never walk in darkness, but will have the light of life.’” Fr. Aleksa discussed the pervasive fear in which we seem to live, a fear that is rooted in death and darkness. He offered, however, that darkness cannot reach out its cold, gray hand and snuff-out even the smallest candle. Light, conversely, will always drive away darkness even in the blackest midnight, or in the depths of some earthly cavern. Therefore, by clinging to the light and life of our Lord Jesus Christ, darkness and fear can have no lasting power over us. 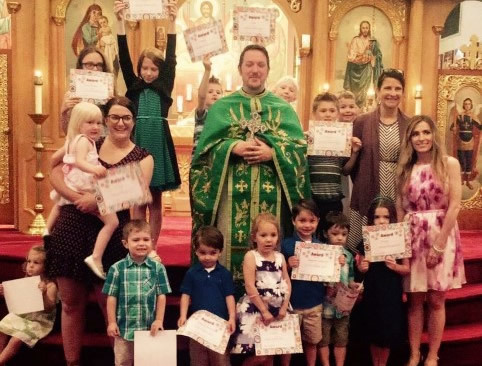 The parish rejoiced in its children following the kneeling prayers of Pentecost, distributing their 2017 Church School participation awards. On behalf of the Parish Council, Fr. Aleksa also offered a gift to this year’s High School graduate, Grace Breedlove. He also recognized college graduates Geoff George and Rachael Tobias. The parish also welcomed Mira Lazic, who will be joining the parish in the fall to offer Serbian language and culture classes to all interested children. Immediately following Divine Liturgy, the community gathered around the church school rooms for pizza, cupcakes, and fellowship.